Has it really been nearly a month since my last post? So lots of new and exciting news. In my last post I reported that I was working again, and all is good. My body is slowly adjusting to the heavy lifting and being on my feet for 10-12 hours a day, 4 days a week. Hubby is awesome and brought me home a whole load of new shoes to try on the other night and they've helped an immense amount with the pain in my back, knee and heels. Amazing the amount of difference shoes can make, huh? I'm still sore at the end of the day, but it's manageable pain, not crippling, want to cry pain. I'm hoping that soon I'll be able to get into my routine a little better and will be able to start doing more stitching in the evenings, right now I'm still pretty tired at the end of the day. I've been really trying to be productive with stitching, but I keep getting roadblocks thrown at me. I signed on a few months ago to do an ornament for TGOS. My first idea wouldn't work because the fabric colours I wanted to use didn't exist. Well that's not true, they did exist, just not ALL in the same fabric. So I changed the idea slightly and ran with it, ordered my materials in early July and then... waited. And waited. And waited. After six weeks, when the package still hadn't arrived, I contacted the supplier and re-ordered. After another few weeks, a package arrived - the second one. That was two weeks ago. The first is lost somewhere in the black hole otherwise known as Canada Post. It cleared customs, that much I know. Where it went from there, is a mystery. This is now the FIFTH package of mine that they've screwed up on this year alone. Won't go into full details, but it's to the point where I'm terrified of ordering anything anymore. I give myself months of lead time and they still can't manage to deliver properly. So my months of lead time for the ornament turned into a couple of weeks. Had that been the only issue, I wouldn't be so grumpy. But no, the saga continues. If package #1 had arrived in a timely fashion, I would have had time to realize that the bead colours I had ordered wouldn't work. But because they only arrived two weeks ago, I had to figure out something - and fast. I did order some different beads online, but it's doubtful they'll be here until next week - given CP's speed of delivery. So I decided to do the unthinkable. I went to Mary Maxim. I stopped shopping there years ago for several reasons. First, because their staff are completely useless when shopping for cross stitch supplies - they know nothing about anything except what they keep in stock. If it isn't on their shelves, it doesn't exist as far as they're concerned. Second, because I was tired of paying double to triple suggested retail price for things I could get far cheaper elsewhere. And third, because it's a long way to go just to find out that they're out of stock on something, which they almost always are. So back to my story. I got to Mary Maxim, and they were out of the Kreinik #4 braid in 032 I wanted extra of (surprise surprise) but they did have Mill Hill beads (which I avoid if I can but this was an emergency) so I picked up a few colours I thought might work. That was a chore in itself as they were a complete mess of mixed up colours. I then found they DID have a few colours of Delicas, so I picked up those as well (same colours I'd ordered online). I check out - a painful process. Let me just say, that ONE gram of delicas at Mary Maxim is as expensive as the EIGHT gram packs I got online. Anyway, I got home and attempted to start my beading. Lo and behold, the idiot at the checkout forgot to put the red and green delicas in my bag. I checked my receipt and I DID pay for them. Long story short (yeah right) let's just say this was my last ever trip to Mary Maxim. Thankfully the Mill Hill beads sort of match the threads okay. The red still isn't as red as I'd have liked, it's kind of orangey, but oh well. It's the best I could do. 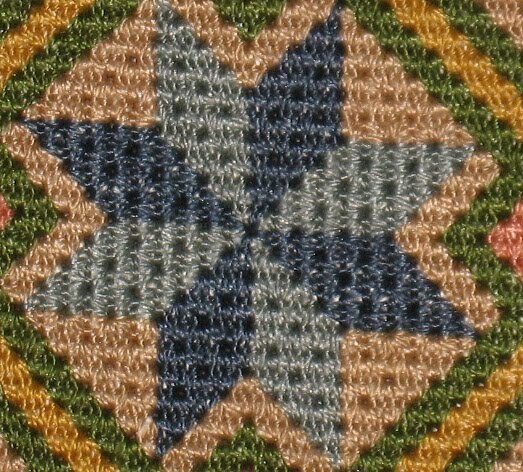 And thankfully I had enough of the Kreinik to finish the design - I'll have to use blending filament for the rest, but that will work just fine. So I have about 1000 more stitches to put in and then I have to assemble and mail the ornament. It may be too late at this point. If it is, I'll release it as a standalone. So what else is new... well, while waiting for materials to arrive (I know I say that a lot, but it's always the case!!) 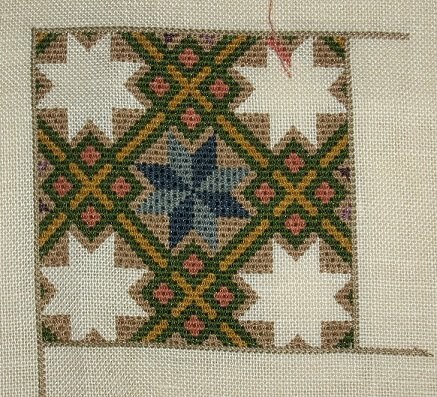 I started Needle's Prayse Celtic Sampler. I got a little bit stitched, but not a whole lot before I put it away. It's lovely all stitched up I must say. 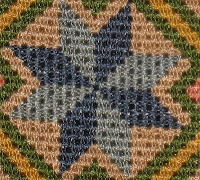 I took a close up shot of the stitching so you could see how cool the texture the queen stitches is! 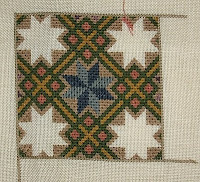 I'm stitching it on 34ct Legacy Linen in Devonshire Cream - though there will be no background showing at all, it's all fully covered. I thought it was Weddigen linen at first, but then I found my piece of Weddigen in my stash drawer, and the only other thing I had in that count was the Legacy. lol It's charted for 40ct, and I did start it on that originally, on a piece of 40ct Graziano I had. But the holes in the Graziano are pretty tiny - it's near impossible to get that needle through the hole as many times as you need to with the queen stitches - in some spots where the stitches meet, you're going through the same hole as many as ten times. So I restarted it. I'm using the suggested NPI threads, which are just heavenly. I got some stash over the past few weeks. The new colours from Gloriana (as well as my threads for the ornament) which are just lovely, plus the Nashville colours from Belle Soie - which are also gorgeous! And fabric for the Antique Lace Band Sampler. I didn't take pics of all of those, I should but I'm lazy. I DID take a pic of the order I received today, my sale order from The Silk Mill. The blues and mauves are for the Serenity Sampler. I will say one thing - they certainly know how to dye reds. They put DMC to shame. I couldn't get the colours accurate in the picture - I used the flash to show off how shiny they are though! I've said before, I'm extremely fussy about reds. I like the NPI reds, and the AVAS reds, Gloriana does fantastic reds, as does Carrie's Creations, and Belle Soie. HDF reds leave much to be desired next to those I mentioned. These Silk Mill reds are exquisite, and coming from me, the red fanatic, that's saying something. I'm really seriously considering kitting HAED's Butterflies Galore in these - I'm not stitching the background so it won't be TOO terrible. It'll be expensive still but OMG it'll be pretty! Ugh, sorry to hear you've had so many problems with getting things delivered! I'm sure the ornament you've designed will be beautiful. Love the silk threads you got! They are very pretty and shiny.